Commencal must have gotten wind because the price just jumped $200. I have been trying to keep up with them as well. I don’t think there was a spec change for the price change this time. I'm struggling a little bit to get the fork setup the way I want. It just doesn't feel as plush as it should. I've been all over with settings and the closest I've come so far is having 55 psi with 1 volume spacer. I just changed to 50 psi with 2 volume spacers to see how that feels, but if it's still too harsh I'm going to be a little annoyed. I've thought about changing the fork to 160mm to take some of the sting out of bigger hits and braking bumps. The max axle to crown measurement per Commencal is 561mm. Fox lists the axle to crown at 150mm travel as 557 +/- 5mm. Going to 160mm travel would make that 567mm. Realistically, is there any reason that this wouldn't be alright even though it's slightly outside of the recommended range? ...Or will a Luftkappe upgrade net the same effect? which fork are you on? By all accounts the GRIP2 is the best thing out there. I don't think a 10mm increase in travel will help all that much with harshness. Adding a token like you have, lowering pressure, and maybe backing off HSC compression a bit might help if you're getting beat up on big stuff and not using all your travel. You might want to speed up your HSR as well? I agree that the Grip2 is a bit of a minefield during setup. I haven't even gotten enough ride time to figure mine out. Check out The Lost Co. on Youtube. They have a great Grip2 setup video. Also the recommended setting configuration that Pivot and Yeti have on their websites are pretty good for getting a baseline of settings. British Edition, so 2019 Factory 36 Grip 2. That's why I'm a little annoyed by the lack of sensitivity from the fork. There are actually quite a few people that are saying it's a bit harsh, myself included. I'm thinking that I'll go with the Luftkappe and SKF green seals rather than bumping to 160mm. I have a pretty good handle on suspension tuning, but this one has me confused. how to people find the ESTA on this bike? anyone measured at full extension with an angle finder? Hey, I'm 6'2.5" with 35" in-seam and was worried about the ESTA being alot slacker that 76.5. I haven't measured the seat angle, but I compared it to my Bronson with a stated 74 seat tube angle. The centre of the seat post at full extension is 1.5" further forward to the bottom bracket than on my Bronson, so it's definitely got me further forward. I still have room to slam the rails forward if I want, but for now I've matched the seatpost centre distance to handlebars to match my Bronson so it should feel the same when I'm seat and pedalling, but now my hips are further over the bottom bracket than before. What's your weight? I'm about 180 geared and started with mine at 50psi. It had one token but I just took it out and put a ramp control cartridge in. I was talking to a friend whom has more time on the grip2 and he stated that on the compression side he runs very little low speed, and even less high speed. Hey i finished my build and had a first ride on my local trails. Build it up with a 150mm pike, 55mm super deluxe, zee brakes, gx shifting, flow ex/hope/superstar conponents wheels, maxxis dhf/agressor tires and a renthal cockpit. I am 193cm and the XL fits perfekt. Im super happy with the bike, really confident on the trail from the beginning. Pedaling up the hill did feel good (coming from a Nicolai Ion 16). Only thing that inhahe to get used to is my heels sometimes touching the rear end. And i cannot fit a 600ml waterbottle in the frame because of the super deluxe. Has anyone an idea how to move the bottle cage more to the bottom bracket? There would be enough room. The fork felt much better. My only complaint at the moment is lack of sensitivity to initiate travel. It's a bit harsh on light chatter, but much better than before in heavy braking bumps. I just ordered the Luftkappe. I'm thinking that should fix the rest of my issues. Good to hear you made some progress. Do you find the fork starts diving too much if you backed out compression even more? Curious to hear your thoughts on the Luftkappe. Having only 50 psi in the fork really makes tuning the mid stroke difficult as you don't have as much margin for error with higher sag numbers. I have a decent amount of LSC dialed in to keep it riding higher under small bumps and less HSC to make bigger impacts softer. I'm hoping the Luftkappe will allow me to run slightly higher in the travel and be more supple in the initial stroke so that I have more room to tune the HSC/LSC adjustments. I will definitely have an update after a few rides on the new air piston. As mentioned before, this bike wants to go fast downhill. At the beginning of my descent on the Meta I was a bit nervous, but my confidence kept progressing as I kept going down. The bike just kept eating up the trail, it wanted to keep going faster and faster. I get the impression that Commencal don't know how to build a bike that isn't a monster going down hill. I see, it sounds to me like you're experiencing the harshness from the compression circuit so maybe the piston kit will make up for a bit of that. I'm going to try your settings tomorrow and see what mine does. All in it doesn't sound typical of a Fox fork. I've had a bunch of Rc2s and a Fit4 and they have always been butter. I've been really interested in this mod, but want to get more time on the grip2 before making such a big change. Interesting. That's the first time I've seen that. Looks like it could be a very useful mod. I'm with you though. I think I'm close to having mine dialed at this point. We'll have to see how it is after the Luftkappe. If I'm still not satisfied I might give this a try. Interesting to say the least.. I'm feeling pretty happy with my fork, I hit some chunky trails yesterday and it was doing its job well. This was first ride after installing the MRP ramp control cartridge. I played around with that a bit and settled on having it at set 5 clicks in which I think should be something like 2ish spacers? It's real nice to be able to dial in the progression on the spot. Also really enjoying the TR, its a certified shredder. I have yet to feel under-biked and it's a treat on the climbs. Anybody know what would be max insertion depth on the seatube? 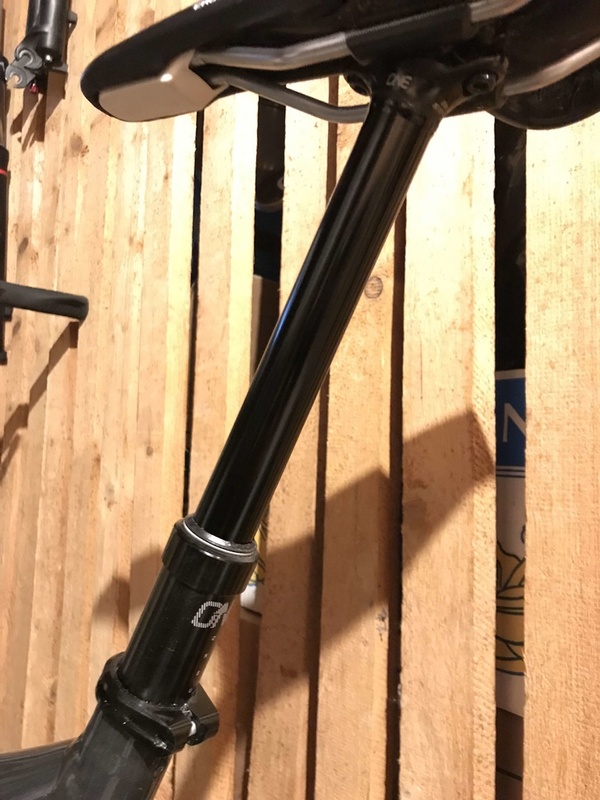 I'm wondering what length dropper I could fit on a medium frame - 150mm vs 170mm OneUp dropper (I have very long legs...). Thanks! I can get some numbers for you tomorrow. Have a 150mm One Up in my medium frame. Anyone seen Commencal IG, another "Bike of the Year". Thanks, it's much appreciated, especially if you have this exact set up! Dear all, long time only reader, now I post if I can help. I have a medium frame base model 2019 TR, and I'm using the 170mm OneUp dropper. Completely inserted, the exposed part is 47mm, giving roughly 255mm from collar to saddle rail. This is the absolute maximum insertion for the 170mm, since if I try to insert it even lower, the actuator get jammed in the seat tube, and the cable get stuck. Luckily, this height is perfect for me when pedalling, and insanely low during downhill. That's exactly what I was looking for. I didn't think I'd have such a precise answer - thanks so much! My 150mm post has 56mm exposed, and would let me drop it only about 5-6mm before the cable/actuator started having problems. If you weren't sure, I was going to suggest getting the 170mm post anyhow, and shimming it down to whatever was needed. Did that with this post on my prior 2016 Meta AM frame - 150 and it would not place nicely with the main pivot bits and entry hole. 140 and it worked just fine. What do you guys think of putting 160 fork on it? Also I'm in a market for a 150 or 160 fork if anyone is selling. It exceeds what they list as the max length but I don't think its that big of a deal. I don't think you would be able to notice the difference either way. Settings are spot on and I'm sure the fork will only feel better the more I ride it and it breaks in. Don't feel the need to go to 160mm anymore. The Luftkappe made the most dramatic change to the feel of the fork. It's much softer off the top and mid-stroke feels much better as well. Well worth the money IMO. Last stages of a bike decision. Is it just me speclist on some of the models abit wierd? The race is 200 more, and has NX, but the ESSENTIAL got GX? The all mountain 29 got piggyback dpx at essential spec on same price, trail 29 only dps. 700 up from ESSENTIAL til BR, dpx2 shock, grip 2 cartridge and XT brakes. thats quite a good upgrade for the money right? I agree the Essential vs. the Race are a bit mixed up part spec wise. On a budget I would probably go for the Essential and upgrade later as needed. Otherwise I would skip the race and just go for the British Edition. You're getting a factory fork/shock, better wheels, better seat, and better bars/stem at that level.